Scrappage programs have boosted new-car sales in countries such as the UK, Germany and the U.S.
LONDON (Reuters) -- Britain's vehicle scrappage scheme ended on Wednesday after contributing to a fifth of new car registrations since its launch, the government said. The scheme gave motorists 2,000 pounds ($3,007) to trade in cars more than 10 years old for new, more fuel-efficient vehicles. The incentive was brought in last year to offset the impact of the economic downturn and boost consumption and protect jobs. Countries including Germany, France, Italy Spain and the U.S. had introduced similar programs. The 400 million pound ($600 million) UK initiative has helped 400,000 customers since it was introduced in the budget last April, the government said. "The scheme was always time limited and today as it closes I am pleased to see scrappage has delivered the results we aimed for -- not just for manufacturers, but for the whole industry and its supply chain," said Business Secretary Peter Mandelson. The government said scrappage had contributed to about a fifth of all new car registrations since the scheme started, with a survey showing a half of those using the scheme had never bought a new car before. The survey also found more than half of buyers would not have purchased a new car without the scrappage scheme. The Society of Motor Manufacturers and Traders said that British car production had risen for the fourth successive month in February, up 62.7 percent from the year before. 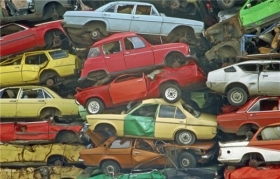 However, it has warned that conditions would get tougher after the scrappage scheme ended. The Department of Business said the initiative had helped support 4,000 jobs in the car industry which employs 180,000 people in Britain and accounts for 6 percent of manufacturing employment.